Impress the guests at your Kentucky Derby party with the latest news from the horse world. Here’s what is going on this week. The Kentucky Derby! (Obviously.) It’s the 140th running of this prestigious race which serves to remind the non-horse world that horse racing actually does still exist. So a bunch of very expensive three-year-old Thoroughbreds are going to run while people in big hats watch. Same as ever. But there’s always lots of other stories that pop up in both the mainstream and equestrian media around this time of year. Lots of equine organizations use the attention that comes from the Kentucky Derby to hold fundraisers. One that I’d never heard of is a charity in Minnesota called This Old Horse. I love it. They take in the old and infirm equines, and they’re hosting a 5K run on Derby Day. The Washington Post did an item on Old Friends, a Kentucky and New York based charity that provides a home for beloved racehorses after they retire. They’re the real deal. Check it out. Because I don’t know much about racing, I like to pick my Derby horse based on his or her name. That’s why I was sad to hear that Hoppertunity was scratched from the race. But you know what? This year I’m putting my support behind Vicar’s in Trouble, who has a pretty good name and Rosie Napravnik in the irons. Napravnik was the first female jockey to win the Kentucky Oaks. This year, could she be the first to win the Derby? I hope so. Go Rosie. I watched a fair amount of Olympic figure skating this winter, and I’m not afraid to admit it. If you did too, perhaps you saw some commentary from retired skaters Tara Lipinksi and Johnny Weir. Both can speak with knowledge and experience about the sport of figure skating, but they were really there to talk about the fashion and flavor, and to that end they are a logical fit for the fashion beat at the Derby. Can’t wait to see their hats. Speaking of fashion, ever wonder why jockeys have to dress the way they do? The blog Horse Country Chic wrote up an interesting history of silks and how they came to be the iconic symbol of racing that they are today. The New York Times jumped on the horsey news bandwagon with a piece about Metro Meteor, the painting Thoroughbred. Of course, we totally scooped them on this one, having published an article about Metro last year. And because it’s 2014 and this is what media outlets do now, USA Today wants you to find out what your name would be if you were a Derby horse. I’m Flash Feather. Not bad. In non-racing horse-sport news, there are still quite a lot of tickets for the Alltech FEI World Equestrian Games 2014 in Normandy this summer, according to this article. So you can still get your seat in the stadium, but you probably shouldn’t wait too much longer to book your hotel and flight to France. And if you do these things, please let me know if I can hide in your suitcase. Also in WEG news, there is a chance that Lexington, Ky., home of this prestigious publication, will host the next Games in 2018. It’s down to either Lexington or Montreal, Quebec, and apparently we’ll know which one it is by this June. Montreal is lovely in the summer, but I do have to say I’m pulling for our little town down here in Kentucky for entirely selfish reasons. 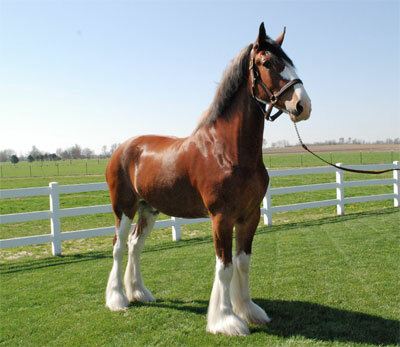 A 6-year-old gelding named Mark became the highest selling Clydesdale ever sold at the National Clydesdale Sale. A horse like this will set you back $60,000. That’s a little too rich for my blood, but he is a good-lookin’ guy. It’s tornado season in the south and Midwest. With hurricanes and floods, you can sometimes get enough warning to evacuate your horse in time, but tornadoes don’t really provide such courtesy. The advice for most horse and livestock owners is to let their animals loose in the biggest area possible where they have a chance of escaping the storm instead of in the barn where they’re helpless if it’s in the path of destruction. But one Oklahoma horse owner came up with a different option: A storm shelter for horses. It’s pretty interesting. I think you’d have to practice feeding your animals in there or something to make sure they’re not panicked—it’s similar in size to a large horse trailer but with no windows. But it would certainly provide some peace of mind in a storm.